Following the opening of the fast seafood shack Frankland’s Crab & Co. this spring, Scratch|Restaurants chef-owners Phillip Frankland Lee and Margarita Kallas-Lee unveil their second concept, The Monarch, within the historic Montecito Inn on Wednesday, August 1. The Monarch pays tribute to the treasures of the Central Coast with local cooking built around a rustic, wood-burning hearth in an elegant, all-day dining room and bar. Offering a collection of vegetables, fruits, herbs, seafood, and meats – paired with the regional wines – Lee helms the kitchen’s arcadian approach to living off the land. The Monarch at the Montecito Inn draws inspiration from restaurants dotting Europe’s countryside. Directed by chef de cuisine John Butler (Mélisse, Foreign Cinema), the menu at The Monarch sources ingredients locally from Central Coast with the majority coming from within the borders of Santa Barbara County, from land to sea. Upon opening, this includes beef, pork and duck from Watkins Ranch; abalone from Cultured Abalone Farm; pastured eggs and avocados from Sage Hill Farms; lamb from Jimenez Family Farm; micro greens and wild flowers from Flora Vista Farms; herbs, greens and wild plants from Earthtrine Farms; honey from Wylde Honey Wines; new potatoes from Weiser Family Farms; red butter Salanova lettuce from Roots Organic Farm; papayas and tomatoes from Golden State Papayas; sunflower seeds and sprouts from Ojai Sprouts; and sea urchin and seaweeds from Stephanie Mutz Diving. In using ingredients that do well in the Santa Barbara climate akin to the Mediterranean, The Monarch emphasizes why the region is commonly promoted as the “American Riviera”. Local oysters, fine spreads, and an array of flatbreads start the meal, with options such as an ocean-imbued Sea Urchin Spread with uni oil and salted cheese on sourdough bread, or a Goat’s Milk Flatbread with lemon black pepper chevre, gaunciale, pea tendrils, and smoked local honey. Carefully composed appetizers include Abalone à la Flambadou with bone marrow, lemon suprème, and capers; Yellowtail Crudo with papaya salad, passionfruit vinaigrette, and fingerlimes; or Grilled Peaches with corn pudding and housemade burrata. Entrees are served family-style, with the chef’s selection of shareable sides to accompany each main dish – each showcasing the myriad cooking methods of the wood-fired hearth – with a Pork Tenderloin brined in brown sugar and caramelized with fresh herbs in the hearth’s brick oven; Mussels from Hope Ranch buried in the coals to steam with sea beans, orange, white cardamom, and herbs de provence; an entire Shortrib slathered with a mixture of red wine and mustard before being hung fireside to slow roast for several hours; and Duck Breast lacquered with honey, jasmine, and coriander hung in the charcoal oven and finished on the wood-fired grill. For dessert, Kallas-Lee whips up sweets inspired by the pastoral environs, such as Strawberry Mousse with creme fraiche and berries, and fresh Donuts with lavender and maple. Celebrating the region’s vintners, the wine program at The Monarch, curated by Gavin Humes, spans affordable and rare finds along the Central Coast. Standout selections include Los Olivos’ Solminer Wines, a source for Austrian wines by way of California; Santa Barbara’s popular vineyard Jonata; and Liquid Farm, with its examples of chardonnay and pinot noir. A robust cocktail and spirit selection from beverage director Rui Silva also features area ingredients, squeezed juices, and custom-made mixers, like the Mr. McGregors Revenge with Ventura Spirits’ Wilder Gin, carrot gastrique, lime, and carrot sprigs, or the Day Break with Cutwater Spirits’ Three Sheets Barrel Aged Rum, coffee liqueur, local pistachio orgeat, coconut milk, and pistachio. Beers known to the area meet a rotating draft with specialty release beers from neighborhood brewers. The Monarch, designed in collaboration with Montecito Inn co-owner and designer Danny Copus, includes original columns anchoring the space date back nearly 100 years. Spanning the length of the dining room, a deep oak hardwood bar encapsulates the glowing flames of the hearth. Oversized arched windows framing the dining tables, created by local woodworker Albert Apodaca, provide natural light in daytime, and the glittering charm of Montecito at night. Gold accents, comfortable chairs, artisan-crafted tables, and a string of tufted dining sofas round out the decor. Custom ceramics by locals Gill Isaac Kaufman (Happy Green Merchant) and Wyn Matthews, range from plates and platters to the kitchen’s supply of clay ‘flameware’ for hearth cooking. Overseeing the operation and serving as daily ringmaster is general manager David Rosner (Wine Cask, Bar Boulud). The Monarch is open Wednesday – Sunday for dinner from 5pm to 10pm and bar service continuing until midnight, with a daily brunch and happy hour launching soon. For more information visit themonarchmontecito.com. Since they are opening in a week it would be really nice if they had a menu posted on their website, including prices of course. Your wish is there command. The menu is available with pricing, now. Sean Ponder is the third local ceramic artist. Just read the description of the food they will have and that is all you need to know that mere mortals will not be able to afford a glass of water in there, much less any food. That description alone told me I wont need to even look at the menu to know the prices. We get it. You don’t want organic, farm to table, heirloom, fru fru foods with names from foreign languages. Stick with The Nugget. This foreigner (don’t worry, I am legal, green card and everything) does not mind menus with foreign languages, when there is a need for the foreign language. But too often the foreign language is just thrown in to raise the price as in this place. Heirloom is just another way to raise the price. I really don’t mind organic and farm-to-table though, that generally tastes better. I also don’t mind the Nugget thank you very much, good fries at the Nugget, but the burgers are better at the Habit. I’m totally with you and the coup de grace is the condescending retort from their manager. The sheer number of inferences of their impending greatness is just a little over the top for me. We thk it is perhaps more of an attitude by millenials and other us persons, they really thk they’re amazing, exceptional, and incredible b/c they said so. Add in– endless expansion and PR puff pieces— why not have 1 really good restaurant, than sevl mediocre, and overpriced places in high rent venues–unless it’s a typical hustle? The prices appear very high; so unless one is a trust funder, clueless tourist, or on an expense account–we’ll take a pass. Glad to see they finally put up their menu and Bob is right about the prices. I don’t plan on eating there. Between their narrative and their menu prices it reminds me of that place that opened after Arts & Letters Cafe closed. I think they lasted about a year? before they “reinvented” themselves. Looks nice. If the food is really good i dont think the prices are out of line. With that said i can only describe Franklins Crab shack as terrible. Literally. Hopefully Monarch is good. Very pricey for the carpet baggers from LA. Give them a yr or 2 from support by clueless tourists. It is in Montecito, with stores selling $200 children’s shoes and $150 kids swimming suit, I don’t think any of us need to worry about this place being too expensive. The real question is will it taste good. Now $52 for a 10 oz filet and $42 for a pound of spot prawn is in line with the other fine dining restaurants around here and not that outrageous if you apply the 28 to 35% food cost formula. $52for 10oz steak with some side veggies plus tax and tip (the us has false prices). We are from Mtco and that price is just crazy. More like a Tourist trap for those staying at area hotels. Agree about the prices, but I’m frugal. I saw him on Top Chef. ‘Nuf said, especially if you did too. This, on the Appetizer menu, confused me. But I’d eat it, I love lamb. but ragout AND carnitas? And what KIND of soft cheese? I wish them well. They have put forth an enormous amount of effort, time and a lot of money in this venture. Nontheless, I found the “press release” a real put off. Good restaurants have a humble beginning and the word spreads over time. Far too much self aggrandizing. No need to declare yourself great. Wine “curators” and beverage “directors” Seriously? Montecito Cafe was always busy, well run and appreciated by all. They never drew attention on themselves. They just plain delivered consistent food and great service at fair prices. Two years in the making, and obviously hundreds of thousands invested? I don’t understand the business model as it makes no economic sense. You do not need a business model if you have tons money to burn….. Being locals we waited patiently for a few YEARS for this place to open. 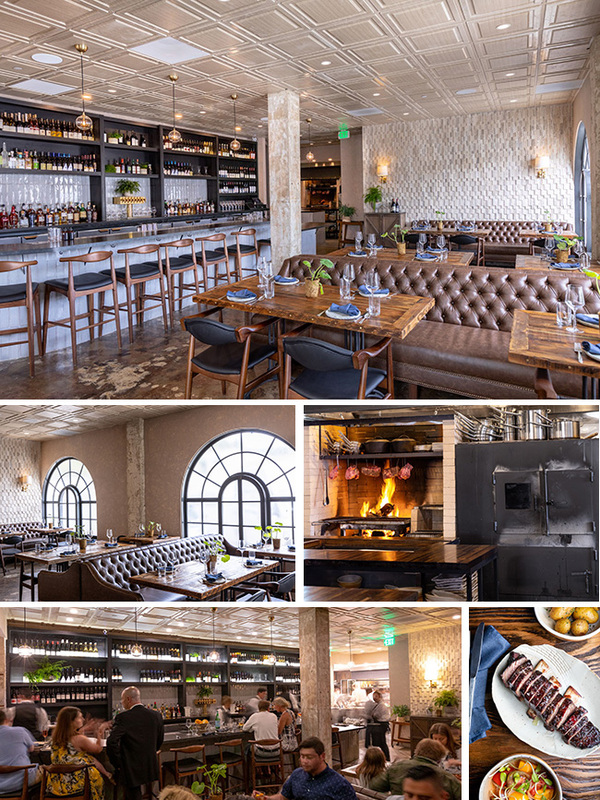 We were so excited for the new chapter of the Montecito Inn, frequenting the neighboring restaurant for dinner many times a week, we were excited to see a new restaurant to open. After being denied entry for the FOURTH TIME tonight for an after dinner drink, we decided we will not be going back. 4. Sorry we are full, and no you cannot stand at the bar for a glass of wine. I always wondered about people who opinionize on a book before reading it. If these menu prices strike you as over the top without even tasting the product or experiencing the atmosphere, adding snide “seasoning” to comments is yelpish. Maybe, just maybe, these guys can live up to expectations. Negativity notwithstanding. Good luck to you, Monarch. Not sure if you are the Ken from El Topo, but if you are I can understand why you don’t like Yelp and bad reviews!